Reston, Va. — About two-thirds of beaches from North Carolina to Maryland have a high probability of eroding as Hurricane Maria moves up the coast, according to the latest U.S. Geological Survey (USGS) coastal change forecast. Approximately 15 percent of that same shoreline has a high probability of experiencing overwash, where surge and waves overtop dunes. Many factors are taken into account when trying to forecast what a storm like Maria might do to the coast, such as differences in the waves that reach the coast and the elevation of the sand dunes in the areas affected. 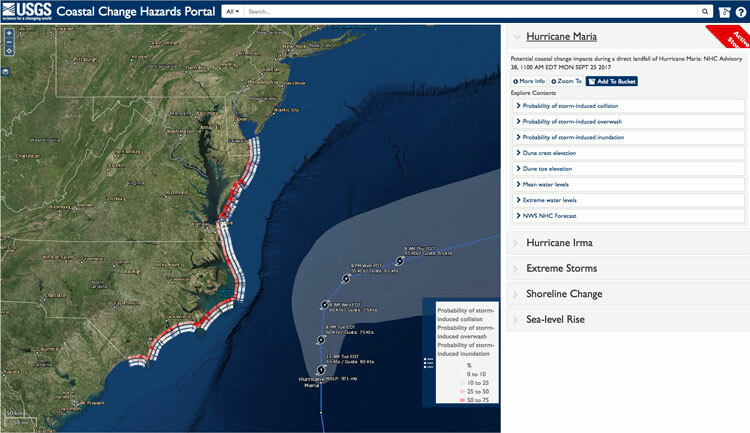 The most up-to-date forecasts for potential coastal change predictions are available on the Coastal Change Hazards Portal page (https://marine.usgs.gov/coastalchangehazardsportal), which is easily accessible to the public. The coastal change forecast can be used by emergency managers to help identify locations where coastal impacts might be the most severe, such as where roads will be overwashed by sand or where it’s possible that roads might go underwater because of storm surge and large waves.